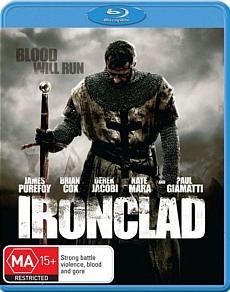 Ironclad Blu-ray Review. Ironclad feels like it would’ve worked so much better as a TV movie rather than being theatrically released. There’s just not enough included in its overall package, with lousy writing, poor acting and odd casting (an Italian-American playing an Englishman; could they find no-one better?) ultimately making Ironclad a fairly dull and poor action movie. Starring Paul Giamatti and James Purefoy, Ironclad attempts to portray the siezing of Rochester Castle by King John in 13th century England. Directed and co-written by Jonathan English, Ironclad is an extremely violent, bloody and repetitive B-grade action film that wastes its impressive cast’s talent on a below average script that holds no emotional value whatsoever. James Purefoy plays Thomas Marshall, a templar knight who leads a small rebel army in the fight against King John (Giamatti), following his unwilling signing of the Magna Carta which limited his power as king. King John is portrayed by Giamatti as an extremely angry man, so much so that scenes in which his spit showering rants feature become almost comical rather than the serious moments they wish to be. Despite his over the top and exaggerated performance, Giamatti appears to be the only actor that seems interested in his character. Purefoy’s portrayal of Marshall is extremely dull to watch, delivering his dialogue so flatly it’s hard to take any interest in what his character is talking about. The weak scriptwriting by English results in the rest of the characters in Ironclad becoming forgetful and uninteresting. As they are basically all introduced within the span of two minutes, it’s hard to even remember their names let alone their intentions for joining the cause to fight King John. As with most historical action films, an attempt to weave in a romantic storyline is present in this film, however it is completely unnecessary to the overall plot of this film it’s a wonder why it was included. The weak storytelling in Ironclad is combined with some of the most violent scenes in a film I have seen in years. Heads are sliced in half, bodies are cut down the middle and limbs are dismembered, all completely shown on screen. Some of these scenes are quite impressive; however the camerawork during the scenes is so shaky that it’s hard to concentrate on what is happening. When the camera is more steady however, the lack of polish and quality to the effects is visible, a possible result of the cuts to the film’s budget during production. Despite being fairly effective in some scenes, the overall use of special effects in this film is below average for a theatrically released film. Ironclad’s set pieces and action scenes look decent in Blu-Ray quality, however the dark filters and effects on the film result in some shots looking a little blurry and difficult to focus on. The audio is quite good, with a reasonably solid soundtrack to the film making the action scenes feel a lot beefier and intense. Special features included on the Blu-Ray only contain cast and crew interviews; not very exciting stuff, but if you enjoy the film you might find some value in watching them. Ironclad feels like it would’ve worked so much better as a TV movie rather than being theatrically released. There’s just not enough included in its overall package, with lousy writing, poor acting and odd casting (an Italian-American playing an Englishman; could they find no-one better?) ultimately making Ironclad a fairly dull and poor action movie.